My only relationship goal is to be with someone who motivates me to become a better person and show me the potential I don't see in myself. NEVER give up no matter how rough things may get, you have got to face your fears and not let others decided for you; only you can make a dream become your reality. Be open to constructive criticism. And use it as motivation to improve your performance. I am in competition with no one, I run my own race, I have no desire to play the game of being better than anyone, in any way, shape, or form. 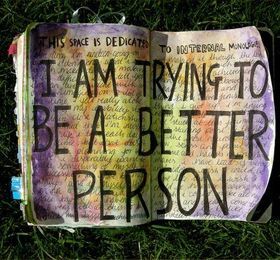 I just aim to improve, to be better than I was before. That's me and I'm free. You can sit around and feel bad for yourself or you can GET UP and try to better yourself. You are where you are right now because of the actions you've taken, or maybe, the inaction you've taken. When was the last time you woke up and realized that today could be the best day of your life? 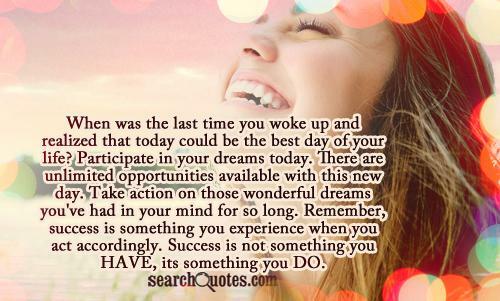 Participate in your dreams today. There are unlimited opportunities available with this new day. Take action on those wonderful dreams you've had in your mind for so long. Remember, success is something you experience when you act accordingly. Success is not something you HAVE, its something you DO. The universe doesnt give you what you ask for with your thoughts - it gives you what you demand with your actions.